Spectacular views and direct access onto East Sands beach. Located a short walk from the town centre, East Shore is a stunning picturesque student accommodation property located close to The University of St Andrews, the oldest university in Scotland. This idyllic location offers modern apartments which offer stunning views looking out onto a beautiful sandy beach and the North Sea. This perfect home from home is ideal for term time student living and is also available for summer letting from May to September each year. Choose from a selection of spacious and modern cluster flats, all of which are en-suite with three quarter beds and plenty of storage. Come home after a hard day of study or sightseeing and relax in your private room, complete with its own private study area and bathroom. Take advantage of the superfast free Wi-Fi (up to 100MB) and call home on Skype, showing off your stunning window views to family and friends. Or why not kick back, relax and log onto Netflix to stream the latest box set series. These stunning rooms share a communal kitchen and lounge in the flat, with plenty of space to whip up that perfect meal for flatmates. You still want more? If all that wasn’t enough, East Shore offers stunning outdoor study areas with direct access to East Sands Beach, winners of the Scottish Seaside Awards since 2001, WOW! Still not impressed? What about a common room with Smart TV and a selection of board games to keep you entertained a nights!? The friendly onsite management team are on hand to look after you during your stay. CCTV, secure key fob access, cycle storage and all-inclusive bills complete the package! There’s plenty on offer in St Andrews for an action packed stay such as traction kiting, land yachting, zap catting or beach yachting and more. Interested in playing at the ‘Home of Golf’, check out our summer lets section. Or if you fancy something closer to home and indoors, East Sand Leisure Centre is on your doorstep, opposite the accommodation, with gym, fitness classes and swimming available. If you would prefer to do some scenic walking, there’s of local routes following the coastal path towards town with great views of the old harbour and beyond that the magnificent ruins of St Andrew’s Cathedral. East Shore is not only the best student place to live all year around, but it will provide a base from your social experiences too. Student organisers listen to your ideas and feedback and organise epic and memorable events. Some classics have included Beach party barbecues, welcome parties, theme park visits, DVD pizza nights and Edinburgh days out to soak up the Scottish culture! Check out the Gallery to see what could be your view waking up everything morning…..
En-suite bedroom measuring 12.5m² with a ¾ bed, en-suite bathroom, study area and wardrobe. The shared area includes a lounge and kitchen area with TV and up to 100Mbps WIFI throughout. Parking, Laundry Room, Bike Storage, Lockable Bedroom En Suite, Desk & Chair, ¾ Bed, WiFi, Common Room. En-suite bedroom measuring 16.5m² with a ¾ bed, en-suite bathroom, study area and wardrobe. The shared area includes a lounge and kitchen area with TV and up to 100Mbps WIFI throughout. Parking, Laundry Room, Bike Storage, Lockable Bedroom, En Suite, Desk & Chair, ¾ Bed, WiFi, Common Room. En-suite bedroom with a stunning view onto East Shore measuring 16.5m² with a ¾ bed, en-suite bathroom, study area and wardrobe. The shared area includes a lounge and kitchen area with TV and up to 100Mbps WIFI throughout. 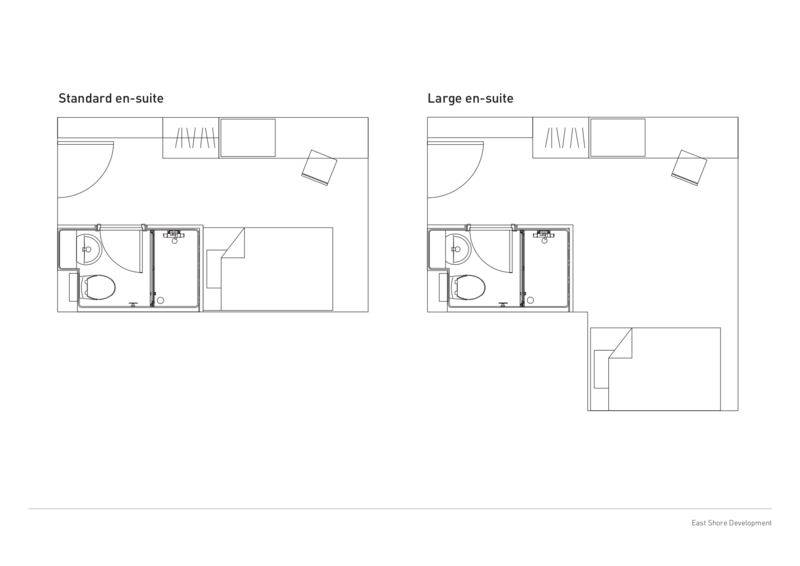 Parking, Laundry Room, Bike Storage, Lockable Bedroom, En Suite, Desk & Chair, ¾ Bed, WiFi, Common Room. St Andrews, named after St Andrew the Apostle, is a former royal burgh on the east coast of Fife in Scotland, 10 miles Southeast of Dundee and 30 miles north east of Edinburgh. For those visiting Scotland on a short break, why not fly into Edinburgh and enjoy the Capital and St Andrews during your trip. This renowned town is famous the world over as the ‘Home of Golf’ with the classic Old Course a favourite venue for The Open Championship. For those wishing to play any of the world class courses in St Andrews, please get in contact and we can arrange package play and stay tours.